Who is responsible for the projected future deficits? There's been a lot of complaining about the president this week, myself included. But one thing he does not deserve blame for are the projected structural deficits over the next decade. 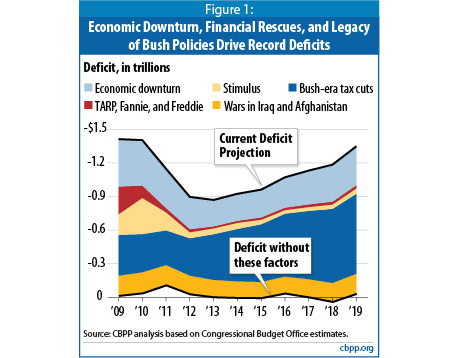 According to a new report issued by the Center for Budget and Policy Priorities, and based on figures from the Congressional Budget Office, the Bush43 tax cuts and the wars in Afghanistan and Iraq are responsible for a much bigger share of the annual deficit projections than TARP, the stimulus package and even effects of the economic downturn (i.e., lost treasury revenues) combined. Yes, Tea Party Nation, you read that correctly: All of this big government socialism that has so frightened you is dwarfed by the deficit contributions of those tax cuts for the most wealthly Americans. But please, run out in the streets with your Obama/Joker signs defending those in Jay-Z's tax bracket. Now, more than ever, they need your help. Sniping aside, look: You can hold Obama accountable for TARP, since he supported it, and of course the stimulus. Though he hasn't withdrawn fully from Iraq and is ramping up in Afghanistan, you can only proliferate or scale back something somebody else started, so even that is at best a push for GWBush. You could even argue that as we move forward the treasury losses of the downturn gradually become Obama's responsibility. The events and policies that have pushed deficits to astronomical levels in the near term, however, were largely outside the new Administration’s control. If not for the tax cuts enacted during the Presidency of George W. Bush that Congress did not pay for, the cost of the wars in Iraq and Afghanistan that began during that period, and the effects of the worst economic slump since the Great Depression (including the cost of steps necessary to combat it), we would not be facing these huge deficits in the near term.